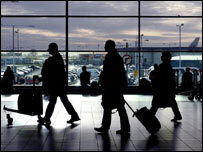 A European law that will improve air travel for disabled and older people has come into effect. Under the new rules, airlines and holiday companies will no longer be able to refuse to fly people because of their disability. The European Disability Forum says it is a "key date" for disabled people. Labour MEP Robert Evans - who pressed for the adoption of the measures by the European Parliament - says seven million people will be affected. "It's incredible that people with reduced mobility have suffered neglect and maltreatment in airports as recently as 2007," said Mr Evans. "Some UK airports have put in place admirable measures to assist people - and I welcome these efforts - but voluntary agreements are not a proper substitute for the law." Mr Evans says that some of the worst cases that he has come across include both low-cost and conventional carriers. A limbless woman being refused permission to travel alone by Air France, one of whose employees said: "A torso cannot possibly fly on its own"
The European Disability Forum (EDF) is urging disabled passengers and those travelling with them to use the new regulations and complain to the relevant authorities if they feel that their rights have been violated. "Only this way will the new law become totally effective and contribute to overcoming discrimination," said EDF president, Yannis Vardakastanis. Although the move is welcomed by campaigning organisations, some are looking forward to next year, when further measures will be implemented. "We're delighted with the new EU regulations," said Guide Dogs' director of public policy, Tom Pey. "We're also looking forward to the introduction of the requirement that will prevent airlines from refusing to carry guide dogs in the cabin with their owners, which will be implemented in July 2008." Other measures that will come into force next year include ensuring that passengers get a seamless service from check-in to the departure gate, as well as a designated point of arrival. Airport employees will soon have to undertake disability awareness training. And people will be entitled to compensation if wheelchairs or other equipment is damaged in transit. Until now, disabled passengers have had some protection from existing disability rights legislation, but this did not apply to aircraft or across international frontiers. Disability rights campaigners have long complained about the lack of facilities, negative attitudes and essential equipment being damaged by airlines. In a limited survey, Leonard Cheshire, a charity that works to improve rights for disabled people, found that almost two-thirds of people had struggled to board a flight. More than one-third had experienced negative attitudes from staff on aircraft or at airports. "For too long, disabled people have been unfairly treated and discriminated against when it comes to air travel," said the organisation's spokeswomen Annette Laidler. "Disabled people are entitled to the same opportunities to travel as everyone else."